Take two different metals, place an ion transporting medium between them, wire them up to be connected outside the electrolyte solution (perhaps to a voltmeter or potentiostat) and you�ve made a battery. With the ever-increasing demand for portable power, batteries are becoming more and more important. As demands on battery performance increase, so do demands on the systems designed to test them. Gamry appreciates the challenge and is equipped today to test the power systems of tomorrow. Electrochemistry has come a long way from potentiometric measurements, and battery technologies have developed quite rapidly, particularly in the last couple decades. What remains constant is that batteries are�materials science not withstanding�pure electrochemical devices. 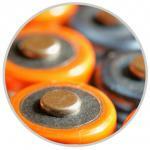 Electrochemical studies and potentiostats are, therefore, critical to battery research. Battery engineers are tasked with producing higher energy densities at lower prices, while focusing on safety concerns, as well. Furthermore, secondary (rechargeable) batteries add additional cycle-life requirements and testing. Battery research and testing features two semi-distinct areas: materials development and full-cell testing. Materials development uses many different chemical and analysis techniques including electrochemical techniques like cyclic voltammetry to determine which materials will be good battery candidates. Full cell testing, which includes cycling (charge/discharge testing) and impedance spectroscopy, then brings the materials together and determines how well they work together in practice.